Home > In the News > It was a weekend to remember! It was a weekend to remember! 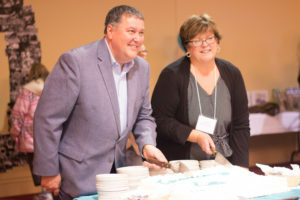 NBACL hosted its major 60th anniversary celebration on the weekend of October 27 and 28, and oh, what a weekend it was, with recognition events, special announcements and launches, and educational and informative workshops and presentations! 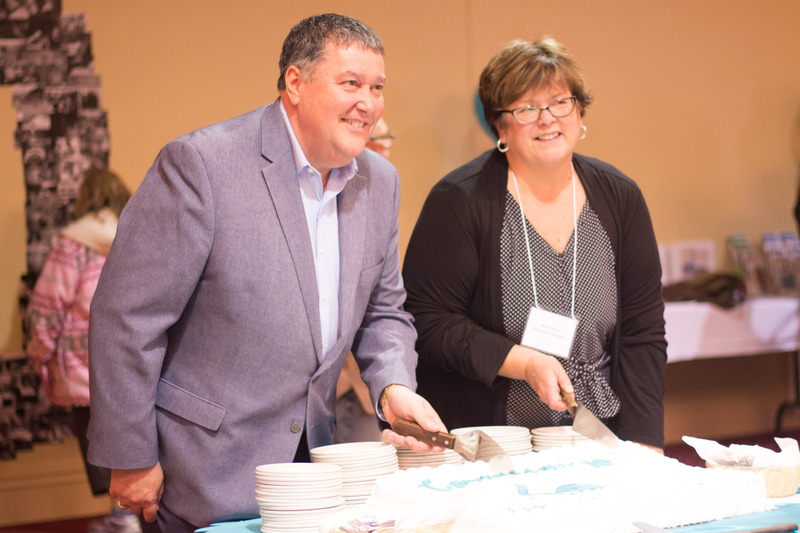 Danny Soucy, Executive Director, and Moira Wilson, President, cut the 60th Anniversary cake! It all started Friday with a day-long workshop that had educators, advocates and NBACL staff and friends abuzz with anticipation. 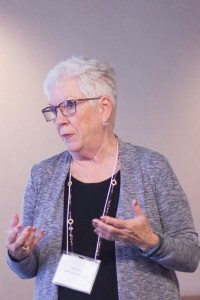 Co-hosted by NBACL and the University of New Brunswick’s Faculty of Education, the workshop featured much sought after presenter, Shelley Moore, a leading thinker and researcher in the area of inclusive education. A resounding success, the workshop attracted over 100 participants who spent the day enjoying Shelley’s stories about her eye-opening experiences and how they informed her innovative and advanced thinking about teaching to diversity. Friday evening was the time for ceremony and recognition, as guests and NBACL employees donned their best garb to pay tribute to the Association’s 60th anniversary honorary chair, Ron Turcotte, and to celebrate recipients of both its premier honour, the Champions of Inclusion Award, and its prestigious Andy Scott Social Policy Award. The 2017 Champions of Inclusion Awards were presented to John Waite, general manager of the Fredericton Inn, for his commitment to and practice of inclusive employment, and to competitive swimmer Jesse Canney of Durham Bridge, who was honoured for his outstanding accomplishments, which fostered awareness and support of inclusion in the field of recreation and healthy living. The two Andy Scott Social Policy Awards went to government employees Gizèle McCarthy and Janet Thomas. McCarthy, a senior member of staff with the Department of Post-Secondary Education, Training & Labour, was recognized for the significant role she has played in helping high school students and youth who have an intellectual disability receive the preparation, courses and training they need to transition to employment and independent living. Janet Thomas, a former NB government employee with over 30 years of experience working in the areas of policy and planning, was presented with the award for her work on the design and development of the province’s disability support program and her push for policies about individualized supports that have led to more choice for people and more funding for the programs they need. The gala celebration also featured a keynote address by Shelley Moore, who once again wowed her audience, this time not only with entertaining and insightful stories, but also with active audience participation that led many in attendance to remark that Moore was likely the first and only keynote speaker they had seen who could get her audience to try belly-dancing! Saturday morning’s events included NBACL’s Annual General Meeting, a feature of which was the launch of the Association’s first major fundraising campaign, End Exclusion, along with the exciting announcement that the campaign had already almost raised one-third of its $3 million goal! The Association’s Canada 150 project was the star of the show at Saturday’s noon-hour Lunch and Launch. Entitled “Including Everyday Canadians: It’s Up to Us,” the project is a celebration of the history and progress of persons with an intellectual disability in New Brunswick over the past 150 years, and is comprised of a website with an electronic and interactive timeline of the past 150 years of inclusion in New Brunswick, and a downloadable PDF booklet and video, all of which can be found at www.nbacl150anbic.ca. The weekend was rounded out on Saturday afternoon with not only another special presentation by Shelley Moore, who followed up on her workshop discussion of the “Who, what, where, when and why of inclusive education” by addressing the “how,” but also with a series of breakout sessions addressing a selection of topics for parents, caregivers and self-advocates. Praise for the weekend’s organization, fun and all-round quality came from many sources. “I received many remarks from attendees who thought everything was terrific,” Julie Stone, chair of the 60th anniversary committee, shared with her committee members. While the October 27 & 28 weekend may have been NBACL’s major 60th anniversary event to date, there’s still more celebration to come! Watch for the public launch of the End Exclusion campaign in November; events celebrating the International Day of Persons with Disabilities on December 3; a Curling Bonspiel, coming up on January 27, 2018; the presentation of the Canadian Association for Community Living’s Inclusive Education Awards in February; Family United Network events throughout the winter; and the 60th anniversary closing ceremony on April 6, 2018.